Eckstein Hall is one of the newest buildings on the Marquette campus, and will become the new home of the Law School at the university. 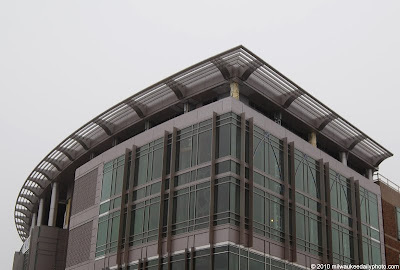 The arc of the building follows the line of the street as well as the recently renovated Marquette freeway interchange. Traveling the freeway from I-43 southbound to I-94 westbound, you pass by the upper floors of the building, and it makes for a very interesting sight. It's a lovely building, especially the curve.